The Renaissance saw the birth of Christian Kabbalah (often transliterated as Cabala to distinguish it from Jewish Kabbalah and Hermetic Qabalah), also spelled Cabbala. Interest grew among some Christian scholars in what they saw to be the mystical aspects of Judaic Kabbalah, which were compatible with Christian theology. The movement was influenced by a desire to interpret aspects of Christianity even more mystically than current Christian mystics. Greek Neoplatonic documents came into Europe from Constantinople in the reign of Mehmet II. Neoplatonism had been prevalent in Christian Europe and had entered into Scholasticism since the translation of Greek and Hebrew texts in Spain in the 13th century. The Renaissance trend was a relatively short-lived phenomenon, ending by 1750. Christian Kabbalah "reinterpreted Kabbalistic doctrine to a distinctly Christian perspective, linking Jesus Christ, His atonement, and His resurrection to the Ten Sefirot", linking the upper three Sephirot to the hypostases of the Trinity and the last seven "to the lower or earthly world", or "would make Kether the Creator (or the Spirit), Hokhmah the Father, and Binah—the supernal mother—Mary", which "places Mary on a divine level with God, something the orthodox churches have always refused to do". Christian Cabalists sought to transform Kabbalah into "a dogmatic weapon to turn back against the Jews to compel their conversion—starting with Ramon Llull", whom Harvey J. Hames called "the first Christian to acknowledge and appreciate kabbalah as a tool of conversion", though Llull was not a Kabbalist himself nor versed in Kabbalah. Later Christian Kabbalah is mostly based on Pico della Mirandola, Johann Reuchlin and Paolo Riccio. After the 18th century, Kabbalah became blended with European occultism, some of which had a religious basis; but the main interest in Christian Kabbalah was by then dead. A few attempts have been made to revive it in recent decades, particularly regarding the Neoplatonism of the first two chapters of the Gospel of John, but it has not entered into mainstream Christianity. The Franciscan Ramon Llull (ca. 1232-1316) was "the first Christian to acknowledge and appreciate kabbalah as a tool of conversion", although he was "not a Kabbalist, nor was he versed in any particular Kabbalistic approach". Not interested in the possibilities of scholarly Jewish influence, which began later in the Renaissance, his reading of newly emergent Kabbalah was for the possibilities of theological debate with the Jews. An early expression of Christian Kabbalah was among the Spanish conversos from Judaism, from the late 13th century to the Expulsion from Spain of 1492. These include Abner of Burgos and Pablo de Heredia. Heredia's "Epistle of Secrets" is "the first recognizable work of Christian Kabbalah", and was quoted by Pietro Galatino who influenced Athanasius Kircher. However, Heredia’s Kabbalah consists of quotes from non-existent Kabbalistic works, and distorted or fake quotes from real Kabbalistic sources. Among the first to promote the knowledge of Kabbalah beyond exclusively Jewish circles was Giovanni Pico della Mirandola (1463–1494) a student of Marsilio Ficino at his Florentine Academy. His syncretic world-view combined Platonism, Neoplatonism, Aristotelianism, Hermeticism and Kabbalah. Mirandola's work on Kabbalah was further developed by Athanasius Kircher (1602–1680), a Jesuit priest, Hermeticist and polymath; in 1652, Kircher wrote on the subject in Oedipus Aegyptiacus. Title of Reuchlin's De arte cabalistica libri tres, iam denua adcurate revisi, 1530. Johann Reuchlin, (1455–1522), was "Pico's most important follower". His main sources for Kabbalah were Menahem Recanati (Commentary on the Torah, Commentary on the Daily Prayers) and Joseph Gikatilla (Sha'are Orah, Ginnat 'Egoz). Reuchlin argued that human history divides into three periods: a natural period in which God revealed Himself as Shaddai (שדי), the period of the Torah in which God "revealed Himself to Moses through the four-lettered name of the Tetragrammaton" (יהוה), and the period of redemption. The five-letter name associated with this period is the tetragrammaton with the additional letter shin (ש). This name, YHShVH (יהשוה for 'Jesus', although the name's Hebrew version would be יהושוע), is also known as the pentagrammaton. The first of Reuchlin's two books on Kabbalah, De verbo mirifico, "speaks of the […] miraculous name of Jesus derived from the tetragrammaton". His second book, De arte cabalistica, is "a broader, more informed excursion into various kabbalistic concerns". 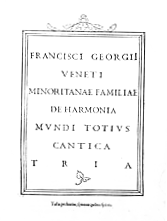 front page of Francesco Giorgi's De harmonia mundi. Francesco Giorgi, (1467–1540) was a Venetian Franciscan friar and "has been considered a central figure in sixteenth-century Christian Kabbalah both by his contemporaries and by modern scholars". According to Giulio Busi, he was the most important Christian Cabalist second to its founder Giovanni Pico della Mirandola. His, De harmonia mundi, was "a massive and curious book, all Hermetic, Platonic, Cabalistic, and Pinchian". Paolo Riccio (1506–1541) "unified the scattered dogmas of the Christian Cabala into an internally consistent system", based on Pico and Reuchlin and adding "to them through an original synthesis of kabbalistic and Christian sources". Balthasar Walther, (1558 - before 1630), was a Silesian physician. In 1598-1599, Walther undertook a pilgrimage to the Holy Land to learn about the intricacies of the Kabbalah and Jewish mysticism from groups in Safed and elsewhere, including amongst the followers of Isaac Luria. Despite his claim to have spent six years in these travels, it appears that he only made several shorter trips. Walther himself did not author any significant works of Christian Kabbalah but maintained a voluminous manuscript collection of magical and kabbalistic works. His significance for the history of Christian Kabbalah is that his ideas and doctrines exercised a profound influence on the works of the German theosopher, Jakob Böhme, in particular Böhme's Forty Questions on the Soul (c.1621). The following century produced Athanasius Kircher, a German Jesuit priest, scholar and polymath. He wrote extensively on the subject in 1652, bringing further elements such as Orphism and Egyptian mythology to the mix in his work, Oedipus Aegyptiacus. It was illustrated by Kircher's adaptation of the Tree of Life. 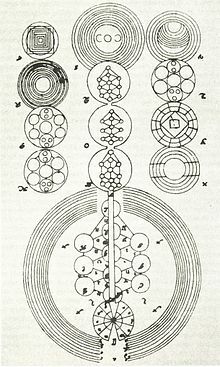 Kircher's version of the Tree of Life is still used in Western Kabbalah. The physician-philosopher Sir Thomas Browne (1605–82) is recognised as one of the few 17th century English scholars of the Kabbalah. Browne read Hebrew, owned a copy of Francesco Giorgio's highly influential work of Christian Kabbalah De harmonia mundi totius (1525), and alluded to the Kabbalah in his discourse The Garden of Cyrus and encyclopaedia Pseudodoxia Epidemica which was translated into German by the Hebrew scholar and promoter of the Kabbalah, Christian Knorr von Rosenroth. Sephirotic diagram from Knorr von Rosenroth's Kabbala Denudata. Christian Knorr von Rosenroth, (1636–1689), became well known as a translator, annotator, and editor of Kabbalistic texts; he published the two-volume Kabbala denudata ('Kabbalah Unveiled' 1677–78), "which virtually alone represented authentic (Jewish) kabbalah to Christian Europe until the mid-nineteenth century". The Kabbala denudata contains Latin translations of, among others, sections of the Zohar, Pardes Rimmonim by Moses Cordovero, Sha’ar ha-Shamayim and Beit Elohim by Abraham Cohen de Herrera, Sefer ha-Gilgulim (a Lurianic tract attributed to Hayyim Vital), with commentaries by Knorr von Rosenroth and Henry More; some later editions include a summary of Christian Kabbalah (Adumbratio Kabbalæ Christianæ) by F. M. van Helmont. Johan Kemper (1670–1716) was a Hebrew teacher, whose tenure at Uppsala University lasted from 1697 to 1716. He was Emanuel Swedenborg's probable Hebrew tutor. Kemper, formerly known as Moses ben Aaron of Cracow, was a convert to Lutheranism from Judaism. During his time at Uppsala, he wrote his three-volume work on the Zohar entitled Matteh Mosche ('The Staff of Moses'). In it, he attempted to show that the Zohar contained the Christian doctrine of the Trinity. This belief also drove him to make a literal translation of the Gospel of Matthew into Hebrew and to write a kabbalistic commentary on it. ^ Walter Martin, Jill Martin Rische, Kurt van Gorden: The Kingdom of the Occult. Nashville: Thomas Nelson 2008, p. 147f, accessed on 28 March 2013. ^ a b Don Karr: The Study of Christian Cabala in English (pdf), p. 1, accessed on 28 March 2013. ^ Walter Martin, Jill Martin Rische, Kurt van Gorden: The Kingdom of the Occult. Nashville: Thomas Nelson 2008, p. 150, accessed on 28 March 2013. ^ Don Karr: The Study of Christian Cabala in English (pdf), p. 2f, accessed on 28 March 2013. ^ Christian Cabala, accessed on 15 February 2013. ^ Don Karr: The Study of Christian Cabala in English (pdf), p. 6, accessed on 28 March 2013. ^ a b Don Karr: The Study of Christian Cabala in English (pdf), p. 16, accessed on 28 March 2013. ^ a b Walter Martin, Jill Martin Rische, Kurt van Gorden: The Kingdom of the Occult. Nashville: Thomas Nelson 2008, p. 149, accessed on 28 March 2013. ^ Don Karr: The Study of Christian Cabala in English (pdf), p. 17, accessed on 28 March 2013. ^ Don Karr: The Study of Christian Cabala in English (pdf), p. 19, accessed on 28 March 2013. ^ Don Karr: The Study of Christian Cabala in English (pdf), p. 23, accessed on 28 March 2013. ^ Rachel Pollack: The Kabbalah Tree: A Journey of Balance & Growth. First edition, second printing 2004. St. Paul, MN: Llewellyn Publications 2004, p. 49, accessed on 28 March 2013. ^ p.339-40 Barbour, Reid (2013). Sir Thomas Browne: A Life. Oxford University Press. ISBN 9780199679881. ^ Don Karr: The Study of Christian Cabala in English (pdf), p. 43, accessed on 28 March 2013. ^ Messianism in the Christian Kabbala of Johann Kemper. In: The Journal of Scriptural Reasoning Volume 1, No. 1—August 2001. ^ Schoeps, Hans-Joachim, trans. Dole, George F., Barocke Juden, Christen, Judenchristen, Bern: Francke Verlag, 1965, pp. 60-67. ^ See Elliot R. Wolfson's study available at "Archived copy". Archived from the original on 25 August 2007. Retrieved 18 June 2007. CS1 maint: Archived copy as title (link). Dan, Joseph (ed. ): The Christian Kabbalah: Jewish Mystical Books and their Christian Interpreters, Cambridge, Mass., 1997. Reichert, Klaus: Pico della Mirandola and the Beginnings of Christian Kabbala. In: Mysticism, Magic and Kabbalah in Ashkenazi Judaism, ed. K.E.Grozinger and J. Dan, Berlin: Walter de Gruyter, 1995. Yates, Frances A.: The Occult Philosophy in the Elizabethan Age, Routledge & Kegan Paul: London, 1979. Wikimedia Commons has media related to Cabalism. Forshaw, Peter J (2013). 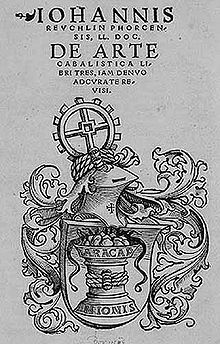 "Cabala Chymica or Chemica Cabalistica - Early Modern Alchemists and Cabala". Ambix, Vol. 60:4. Forshaw, Peter J (2014). "The Genesis of Christian Kabbalah - Early Modern Speculations on the Work of Creation". Hidden Truths from Eden: Esoteric Readings of Genesis 1-3.